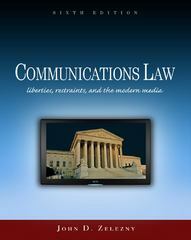 Communications Law: Liberties, Restraints, and the Modern Media (Wadsworth Series in Mass Communication and Journalism) 6 Edition The new edition of COMMUNICATIONS LAW: LIBERTIES, RESTRAINTS, AND THE MODERN MEDIA continues with the reviewer-praised readability, coverage of core topics, and currency that have been its consistent strengths. The author's interesting, hypothetical exercises have been a favorite among both professors and students. As in previous editions, the Sixth Edition includes a thorough update of cases and information to keep the text current.